Herbie the Love Bug is a 1963 Volkswagen Beetle who is the star of several Disney movies and TV series. The lovable VW has a mind of his own and he is a serious contender in auto races where he often drives himself! His look has often changed slightly since his introduction in the late 60’s, but he is distinguished by red, white and blue racing stripes that run from front to back, a racing style number 53 on the front trunk lid, doors, and rear engine lid, and a California license plate with the registration "OFP 857". 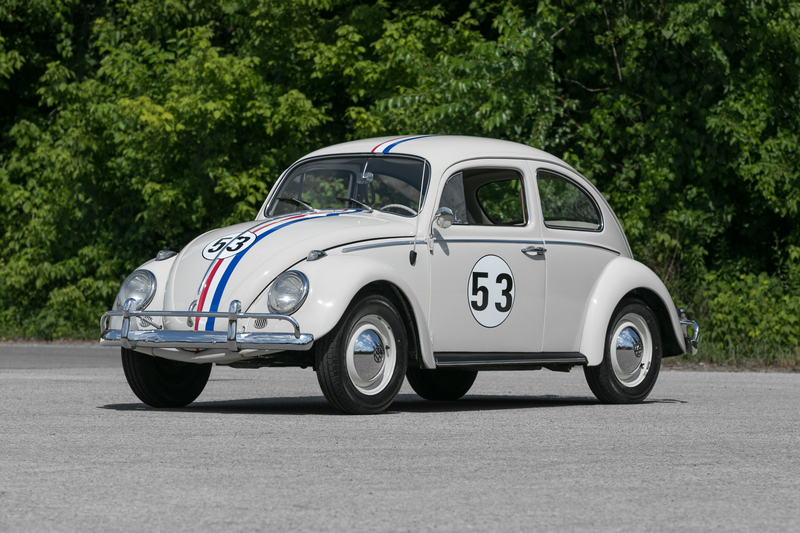 Movie goers were were introduced to Herbie in the 1968 film The Love Bug, when he is bought by racing driver Jim Douglas, and gets his racing stripes and his name from Douglas’ best friend, Tennessee. The trunk lid of the little VW reminds Tennessee of his uncle Herb, who was a boxer and had a broken nose. Hence, the legend of Herbie was born. Herbie has many adventures with Jim Douglas and a whole host of other characters in the films Herbie Rides Again (1974), Herbie Goes to Monte Carlo (1977), Herbie Goes Bananas (1980), and Herbie: Fully Loaded (2005). In the 1982 TV series Herbie The Matchmaker he opens a driving school with Jim Douglas, and the 1997 made for TV movie The Love Bug explores more of Herbie’s origins as he races against his evil cousin Horace the Hate Bug. To film Herbie driving himself in the days before animated CGI, Disney production designers constructed a second steering column under the front seat connected to a complicated system of sprockets and pulleys. The real driver sat in the back seat and sat low enough to see but stay out of the camera frame. For Herbie Rides Again and Herbie Goes to Monte Carlo, the production team installed a hood-mounted fog light which concealed a small camera that the rear seat driver used to see the road!